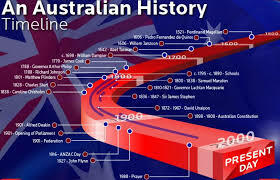 On this history Tuesday I thought I would tell you a bit about the history of Australia, we are going far far back in history. Although much of Australia became populated, the central dry areas didn’t attract settlers until around 25,000 years ago. The population grew proportionately quicker around 10,000 years ago as the climate improved. During the early part of the 20th century legislation’s were passed to segregate and protect Aboriginals. This involved restrictions on where they could live and work and families being broken up. After World War II, assimilation became the governments aim. 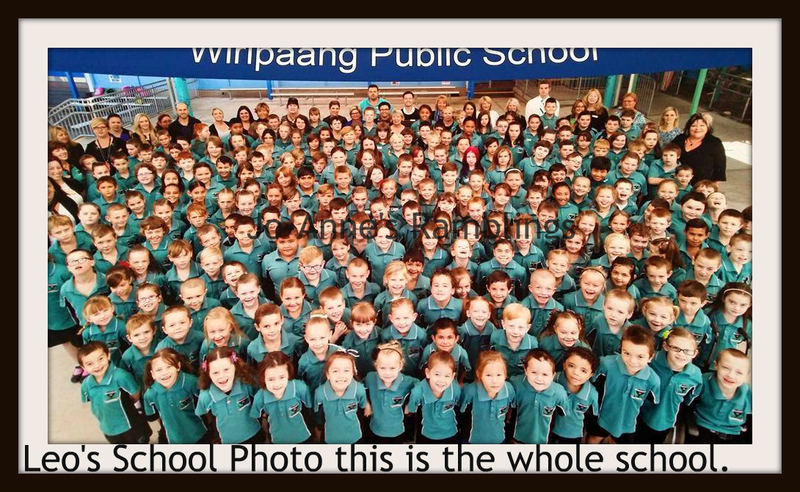 All rights were taken away from the Aboriginals and attempts made to ‘Europeanise’ them. During the 1960’s the legislation was reviewed and the Federal Government passed legislation for all Aboriginals to be given citizen status. However, it wasn’t until 1972 that the indigenous people were given back limited rights to their own land. The situation has been steadily improving for Australia’s Indigenous people, although many feel more needs to be done. I will speak more about our history in the weeks and months to come. I am pretty sure many people know what the Australian flag looks like but since there are many different flags used here in Australia and yes I know in the past I have done a post about our flags but because on a certificate of participation that Blain got last Friday there was a flag we couldn’t post I have decided to do a couple of more posts about flags. So I will start this off with the flag we didn’t recognised. It was this one, anyone know what flag this is, no didn’t think so…………. It was back in May 1992 that a flag was adopted to represent the Torres Strait Islanders, it was designed by Bernard Namok and the copyright is owned by the Torres Strait Island Coordinating Council. The green stripes represent the land, the blue stripe represents the sea and the black symbolises the people. The thing in the centre is a Dhari, a dancer’s headress with a 5 point star to symbolise the five island groups in Torres Strait. Ok all I have to offer this Saturday afternoon, is how to waste a dozen eggs…………..
You break a dozen eggs into a large bowl add some double cream and some sour cream and take a stick blender and proceed to beat eggs and then remember you forgot the Parmesan cheese so turn to get it from the fridge and leave stick blender in bowl. Blender falls over tipping the whole thing over the bench and kitchen floor…………………. Yell to someone to get towels, proceed to clean up and send husband to the shops for another dozen eggs while you clean up the bench and the floor, included having to move the microwave to clean under and behind it where the egg has run to. Five things Friday, yes don’t faint I am doing it this week why because I woke up and realised I could draft a few posts and have them ready to post when the time arises. So here are this weeks five things. Ok I have time to do a quick post before I have to leave and go get the boys from school, I have been out most of the morning. 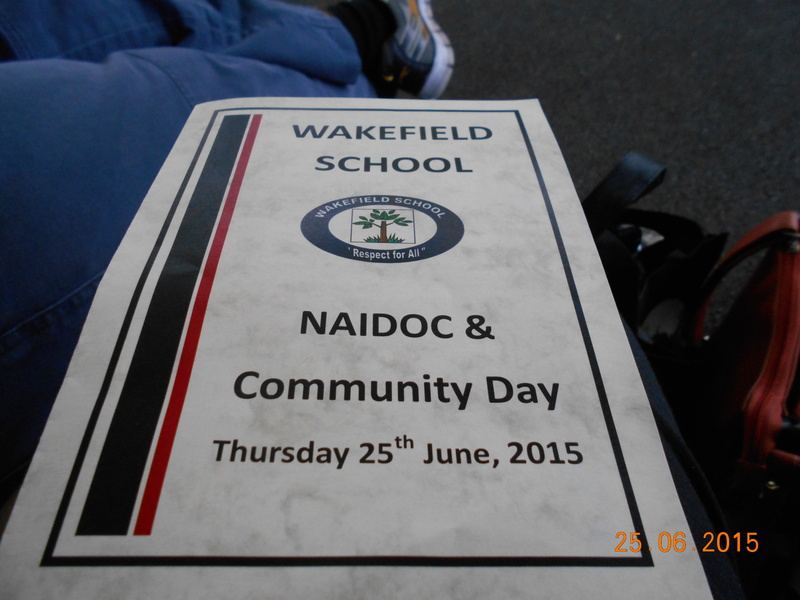 It was Dawson’s presentation day at his school Wakefield and I of course went to it with mum and dad and Dawson’s mother and her father also went, for the first time in ages Dawson didn’t get an award. 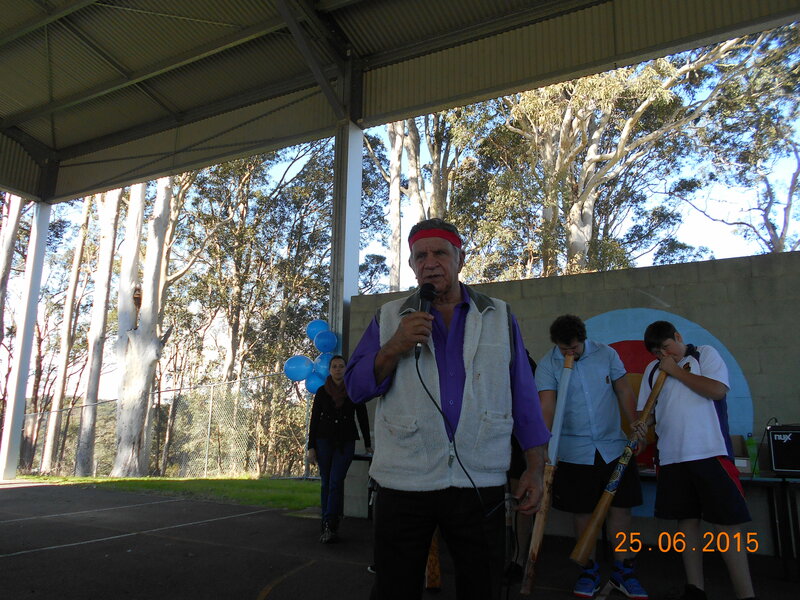 There was a man and a woman talking about aboriginal things he was had to understand and she was hard to hear and they had some boys from another school there playing the didgeridoo. 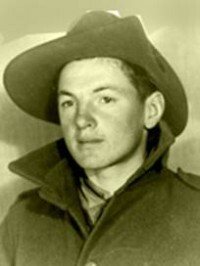 Ok it is History Tuesday and this week I am going to write about another unheard of fella his name is Keith William Young aka Billy Young at the tender age of 15 Billy decided to join the army it was July of 1941. Now it wasn’t any real sense of patriotism or adventure that made him decide to join up it, it was because he was hungry and broke and homeless, Billy was an orphan and the army offered him a food and blanket and five shillings a day. 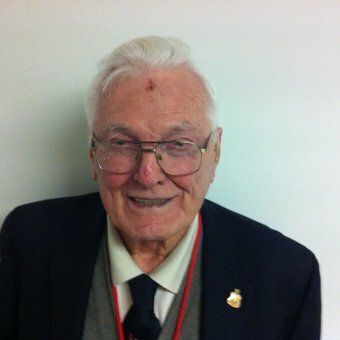 Billy was a member of the 2/29th Battalion that went to Singapore with the 8th Division, he saw a lot of action as the Allies attempted to stop the advancing Japanese Army and was wounded in the thigh. Two years later Billy found himself in the back of a canvas-covered truck on his was to the Sandakan POW camp as a prisoner of the dreaded Kenpeitai, Nippon’s version of the Gestapo and he was still only a kid at the age of around 17. He still owned nothing except the rags he wore, a soiled and bloody pyjama top, a pair of filthy shorts cut from a canvas kitbag and his greatest treasure a pencil stub. During his time at Sandakan he often considered attempting to escape, it was after his mate Jimmy Brown wandered off from the airfield construction site with no intentions of escape, however, when they crept back they realised they had been missed and decided to escape to avoid the punishment that would be dealt out to them. However, they were soon caught and received severe bashings before being taken to Kuching for a trial where they received a four year sentence at the infamous Outram Road Gaol back in Singapore. Many died at this terrible gaol but both Billy and Jimmy managed to survive although they suffered two years of starvation, malnutrition, tropical diseases, along with bashings and the most inhumane conditions imaginable. When Bill returned home he was determined to tell the story of what happened to all the servicemen in Sandakan and Ranau, this he did by numerous drawings, paintings, writing stories, poems and speaking at functions. In 2003 Bill drove alone across from Sydney to Perth, across the Nullabor, to visit our Sandakan Exhibition in August 2003. He took with him six of his original paintings that are part of his “Bamboo Collection”, for display at the exhibition. 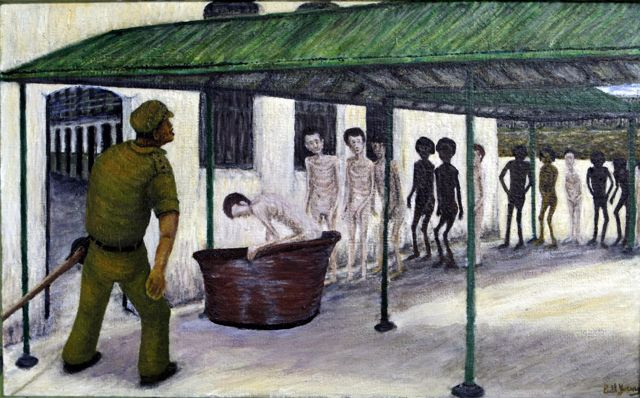 Bill has also completed numerous other paintings, sketches and drawings depicting his time as a POW at Sandakan and later at Outram Road Gaol in Singapore. He tells of his experiences as a young man at war who was only 19 years old when he returned from 4 years of hell. He tells his story to the memory, and to commemorate, the 2,500 Australian and British servicemen who died at Sandakan, on the Ranau Death Marches or at Ranau. And he tells of his experiences so as this shameful episode of World War Two will never again be repeated. He has also written three books,Long Ago in Borneo,Return to a Dark Age and Once Upon a Time in Kuching, about his years as a POW of the Japanese. In the October 1st 2003 edition of the Borneo Bugle tribute is paid by way of a photographic display of Bill’s visit to the West. The editorial in the newsletter sums up our feelings.. 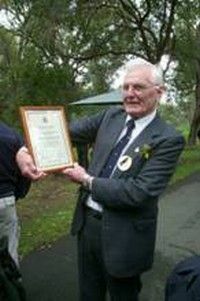 In 2004 Bill was recognised for his services towards the “Sandakan Story” by the Commonwealth of Australia when he was awarded the Order of Australia Medal (OAM).